One More Folded Sunset: Looking Good? Another drear scene of construction, with workers (no hard hats here) rushing to raise the building. Can we find a small silver lining? Yes. The Sand Man truck! 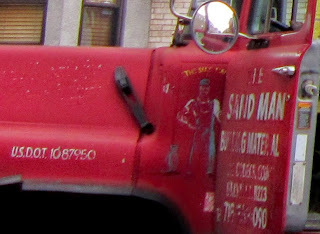 The man himself is getting a bit faint, but still - a classic hand-painted company sign.